Who knew that Audi sponsors an annual jazz festival and hosts an ongoing series of jazz concerts at its headquarters in Germany? Begun in 2001, the program at the Audi Forum Ingolstadt has drawn more than 32,000 fans to two different series: "Jazz in the Audi Forum Ingolstadt" concerts featuring international jazz artists, and the "After Work Jazz Lounge" on Thursdays featuring artists from the German jazz scene. Several live recordings have been produced by the Birdland Jazz Club Neuberg and the Bavarian broadcaster Bayerischer Rundfunk. For its jazz concert series, Audi regularly rented a Bosendorfer grand piano. 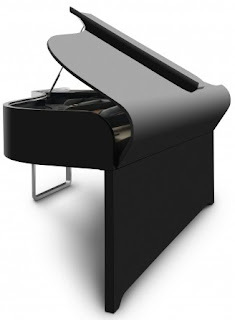 Someone had the idea of designing a piano specifically for the series, and the job went to the Audi Design Center in Munich. It took three years to blend Audi aesthetics with the demands of a musical instrument, specifically one famous for its sound. Keith Jarrett plays a Bosendorfer in the Koln Concert recording; Oscar Peterson's first choice for concert performances was the Imperial Bosendorfer concert grand. Here's a video of Peterson playing "Night Time." Learn more about the Audi-designed Bosendorfer here (more pictures, details, video).